The annual DesignerCon event has, for years, allowed designer toy collectors to view a plethora of pieces by a variety of artists and producers. But, in 2015, a group of these collectors banded together to form Broke Piggy, expanding their passion for art toys into collaborative ventures with the artists they admired. Having consistently displayed innovative concepts within their DesignerCon booth space, Broke Piggy’s 2017 exhibition featured a partnership with Scott Tolleson and Kidrobot, allowing an array of artists to create one-of-a-kind works over Tolleson’s new 5-inch tall Shard Dunny resin form. What is the Shard Dunny? To celebrate Halloween in 2016, Kidrobot issued Tolleson‘s The Odd Ones Dunny Series, a collection featuring creepy and monstrous designs as filtered through the artist’s cartoonishly cute aesthetic. Then in mid-2017, made as a stand-alone accompaniment to this set, Tolleson offered the Shard Dunny in its debut Frost edition, these pieces being professionally cast in resin rather than factory-produced in vinyl. Having been sculpted in this approximately 3-inch tall form by SeriouslySillyK (Kathleen Voigt), Tolleson’s crystalline design was reminiscent of the gemstone golem creatures that appeared in the Forgotten Realms campaign setting for Dungeons & Dragons. For the 2017 DesignerCon, the sophomore color scheme of the Shard Dunny, Kryptonite, was issued as well as the debut of a roughly 5-inch tall rendition of the form, offered in editions matching the two colorations of the smaller version offered to date. For this new larger depiction, Tolleson opted to sculpt the form himself, granting it a cohesive feel with its predecesor while simultaneously being uniquely detailed for this new size. And this recently added rendition was provided to an array of artists to decorate, their unique works forming Broke Piggy‘s Shard Show. Although only briefly mentioned in Roald Dahl‘s book Charlie and the Chocolate Factory and its 2005 film adaptation, the 1971 film adaptation Willy Wonka & the Chocolate Factory used the fictional Everlasting Gobstopper candy as a major plot device. Described as a candy that changes colors and flavors as it is chewed, these became an inspiration for Tolleson‘s own contribution to the Shard Show, the Everlasting Shardstopper. With vibrant, pastel washes of color adorning the form, Tolleson’s rendition mimics the actual Everlasting Gobstopper candies produced by Breaker Confections and, later, Nestlé, which were normal jawbreakers typically composed of three discrete layers of differing colors, the innermost one commonly being pink, mirroring the Everlasting Shardstopper‘s body coloration. It’s not uncommon for Netherlands-based designer toy collective Dolly Oblong to mine popular culture for their creations, so this expertly augmented Shard Dunny taking the form of the Stay Puft Marshmallow Man from Ghostbusters isn’t completely surprising. Given subtle shading through delicately applied icy blues over the white base, the solid shock of blue residing along the lip emits the illusion of a spectral illumination. When lit up, artist Jesse “JRYU” Yu’s Ol’ Crusty piece appears to be formed out of thick rock formations floating upon a sea of magma underneath. Immaculately sculpted in a perfectly imperfect looking rough-hewn form, the boulder protuberance on the base twists to switch the internal lighting on and off. Emerging alongside the graceful cracks in the faux stone hide, the artist incorporates his stylized signature (J★RYU) beautifully into the backside. With the rabbit-like ears of the Dunny decorated to appear as mineral eruptions bursting forth from the form’s base, UK-based artist Squink (Chris Booker) has carefully crafted the look of igneous rock on most of this work’s structure. Employing small areas of discoloration on the surface, delicately executed paints grant a crisp lightness to the edgings while splatters of white and black flecks finish the piece’s seamlessly natural appearance. The husband-and-wife team of Jenn & Tony Bot, a duo also referred to as The Bots, use their signature hand mixed polymer clay coating over designer toy forms to transform their Shard Dunny into the Isn’t She a Gem piece. Rendered with strata coarsing through the sculpted formation, this work’s pock marked hide grants the textured look of true stone which contrasts wonderfully against the smooth, cartoonishly colorful crystal-shaped protrusions emerging throughout. With a completely handmade minecart filled with extracted crystaline forms, the gleefully cute impish miner atop this sculpture is perched in a relaxed sitting position, his delicately crafted pickaxe still clutched in one hand. Accredited to 64 Colors but most likely painted by member Laura Parsons, this Shard Dunny rendition features a canine snout and expressively detailed eyes. With subtle blush coloration dabbed onto the cheeks, lower lip, and ears, this Rock Hound piece is a tribute to those who dig for crystals, whether as a professional or an amateur enthusiast. Artist Doktor A (Bruce Whistlecraft) is known for his signature Mechtorian creations, a series of geometrically-shaped robots that his Quentin Facet contribution aesthetically matches perfectly. Sculpted to appear as if it were formed of metal plates riveted together, with its glistening eyes being the sole differential, there is a tarnishing and patina emerging at various points across the form to give the majority a feel of variance. Emitting an undeniable steampunk vibe, the addition of a clockwork key to the backside is a charming final touch. Following the Japanese concept of wabi-sabi, which embraces the beauty of imperfection, there is an art form known as kintsugi that involves repairing broken pottery without disguising the breakage, noting this aspect as part of the object’s history. And it’s not a coincidence that Candie Bolton‘s contribution to the Shard Show is titled 金継ぎ, the kanji for kintsugi. Using the airbrush painted areas to emphasize the edges of the forms, Bolton creates the look of a disjointed reconstruction, one finished with 24k gold foil, a typical metallic hue used in the kintsugi technique. An inventive homage to this Japanese art form, Bolton’s piece is truly an exercise in smart and subtle execution. 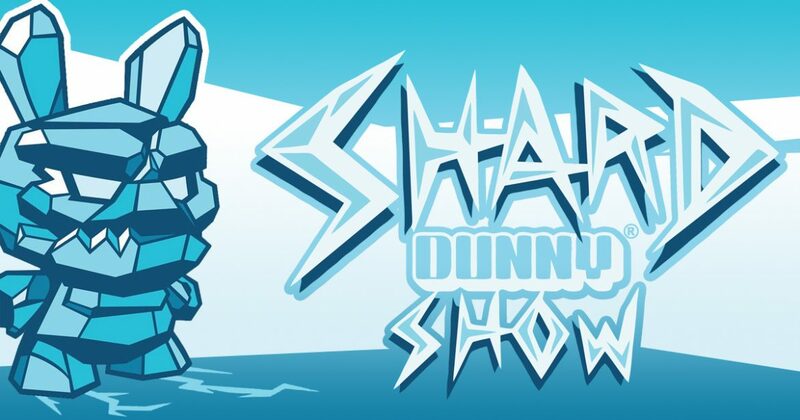 Having used stylized depictions of animals throughout his career to convey stories, Scribe (D.Ross) reimagined his Shard Dunny‘s form into the likeness of a shark. Removing its ears and adding a fin atop its head as well as an elongated nose, these newly sculpted aspects are given an angular nature and cracked adornment to cohesively merge them into the whole’s aesthetic. Decorated with flowing shapes that conform with Scribe’s street art background, the illustrations adorning this perfect predator’s head simultaneously imply a tribal and tag-like nature. While there’s a sense of menace in the scene depicted, artist SeriouslySillyK (Kathleen Voigt) describes the pair within in her Shhhard – Our little secret piece to be a little girl and her big brother. Having radically restructured the Shard Dunny aspect, especially notable in its more subtle jawline and completely new set of hands, this narrative seems to involve the little girl, tentatively known as Gemma, caught in the midst of riffling through her brother’s gem collection. With Gemma created in a similar style to the child component of Voigt’s KRampus Dunny collaboration with Tolleson (read more here), this little girl character has actual amethysts creating her Dunny-like ears. And while Gemma is hiding one stray crystal behind her back, her big brother is concealing something greater: there is a hollowed out compartment in the back of his head, its contents locked behind a lid held in place by a magnet. As for what secret is housed within, that is only for the artist and piece’s owner to know. With vibrant colors playfully gracing Jeremiah Ketner‘s Shard Dunny, each facet’s hue complimentary interacts with the ones surrounding it. The whole being tied together by delicately applied embellishments, Ketner’s contribution revels in the painterly strokes and brush marks left in the wake of his acrylics being applied thoughtfully to the form. The phrase blood from a stone implies an impossible task, but it is one that artist Luke Chueh has aptly named his work for the Shard Show after. Decorating the form with rock-like hues, a frenzied stream of red coloration oozes forth from the sculpture’s eyes. Implying that even the impossible can be made possible, Chueh’s use of blood in his art typically carries the connotation of regret but here it becomes symbolic of hope. Rendering a galactic snapshot across the form of his Shard Dunny creation, Mark Nagata‘s Galaxy Shard is a colorful exploration of the cosmos. Containing the infinite vastness of space within such a small shell, swirling star clusters lure the eye to traverse this form, gazing not upon blackness but rich clouds of color composing the solar system. The cycloptic, anthropomorphized tree atop the contribution by MAp-MAp (Matt Plater) is reminiscent of a yorishiro, a divine tree surrounded by a sacred rope. Found sandwiched between the work’s Dunny ears, these have been remodeled to have mask-like faces similar to those of the tree-inhabiting kodama spirits from Hayao Miyazaki‘s film Princess Mononoke. Whether these allusions are intentional or not on Plater’s part, the tree’s roots are depicted reaching throughout the earth that the Shard Dunny represents, mysteriously stopping just shy of a large gem sculpted into the piece’s backside. With the cracks in its form filled to create veins of gold, the Shard Dunny contribution by Leecifer (Lee Gajda) is a truly thoughtful creation. While the highlights and shading to the pink base are wisely executed, as are the flecks that accent the shape’s assymetrical form, it is the blacklight reactive nature of the whole that really makes this work shine. Sculpting crystalline growths and aspects have long been an signature element of Kristina Drake‘s art pieces, and it is one which she embraces for her Shard Dunny contribution. Adorning her piece with a plethora of crystal outcroppings, each made in a style matching the original’s shape, the slight variations in her form’s purple coloration are accented by slender shocks of white highlighting. With fiery streams hinted below their contribution’s blackened shell, the Kidrobot Design Team have transformed their Shard Dunny into the piece titled Luka Lava. Created by Johnny Draco, Yoshizuma Kumi, Lauren Nus, and Sharon Park in collaboration, this work’s most memorable aspect are the micro-sized Dunny figures depicted climbing atop the form as well as scattered around the lava-like display base. Of particularly humorous note is the singular Dunny‘s head within the molten flow that is brandishing a cigarette in its lips, an image that immediately recalls the signature creation of Kidrobot’s Chief Creative Officer, Frank Kozik, the Smorkin’ Labbit. The Shard Show, a group exhibition featuring interpretations of Scott Tolleson’s Shard Dunny, was part of the two-day only DesignerCon event held on November 11th & 12th, 2017 at the Pasadena Convention Center (300 E Green St, Pasadena, CA 91101).